To be deductible, clothing and household items donated to charity generally must be in good used condition or better. A clothing or household item for which a taxpayer claims a deduction of over $500 does not have to meet this standard if the taxpayer includes a qualified appraisal of the item with the return. A written appraisal should be provided for any noncash contribution of over $5,000. Household items include furniture, furnishings, electronics, appliances and linens. 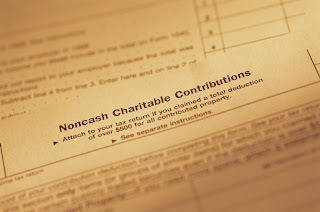 To deduct any charitable donation of money, regardless of amount, a taxpayer must have a bank record, cancelled check, credit card statement, or a written communication from the charity showing the name of the charity and the date and amount of the contribution. For payroll deductions, the taxpayer should retain a pay stub, a Form W-2 wage statement or other document furnished by the employer showing the total amount withheld for charity, along with the pledge card showing the name of the charity. These requirements for the deduction of monetary donations do not change the long-standing requirement that a taxpayer obtain an acknowledgment from a charity for each deductible donation (either money or property) of $250 or more. This provision, currently scheduled to expire at the end of 2009, offers older owners of individual retirement accounts (IRAs) a different way to give to charity. An IRA owner, age 70½ or over, can directly transfer tax-free up to $100,000 per year to an eligible charity. To qualify, the funds must be contributed directly by the IRA trustee to the eligible charity. Amounts so transferred are not taxable and no deduction is available for the transfer. Not all charities are eligible. For example, donor-advised funds and supporting organizations are not eligible recipients. See Publication 590, Individual Retirement Arrangements (IRAs), for more information on qualified charitable distributions. Contributions are deductible in the year made. Check that the organization is qualified. Only donations to qualified organizations are tax-deductible. For all donations of property, including clothing and household items, get from the charity, if possible, a receipt that includes the name of the charity, date of the contribution, and a reasonably-detailed description of the donated property.